This morning the street was raving about the J.P.Morgan Chase & Co. (NYSE:JPM) earnings. The stock was trading higher in the pre-market by 0.85 cents to $47.56 a share. Since the opening bell rang at the New York Stock Exchange the stock has declined sharply lower trading negative briefly before bouncing off of an intra-day support level. The stock is now trading higher by 0.15 cents to $46.78 a share as of 9:55 am EST. Financial stocks could be in play for most of the day. Other leading financial stocks that are trading on the weak side include Wells Fargo & Co. (NYSE:WFC), and Bank of America Corp. (NYSE:BAC). These two leading financial stocks have also faded sharply from a gap higher open to now trading slightly negative on the session. WFC will have intra-day support around the $30.55 level. 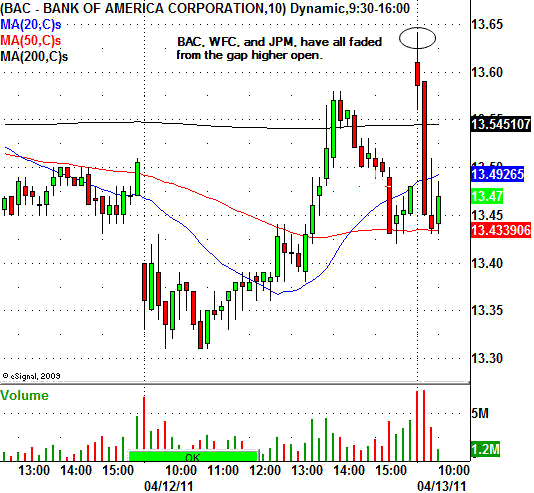 BAC will intra-day support around the $13.35 area.